Kampfgruppe Sud / Battlegroup South is now in operation almost seven years. It was set up initially as a club dedicated to the restoration and preservation of original German WW2 vehicles. 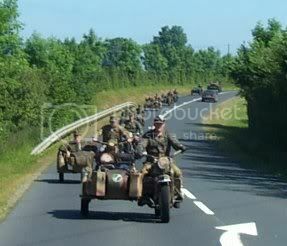 The Club started with 2 BMW R72 outfits and then obtained 2 Kubelwagens and a Zundapp Solo motorcycle. Initially, the Club had about 5 members. This has now risen to 30 members and over 14 vehicles. We have maintained this number continuously and recruitment into the Club is slow as we do not wish to swell the numbers too quickly. We do not take nutters, political activists, neo-Nazis, or any undesirable types. Generally, a probation period of 1 year is needed and the Club pass a vote at AGM on acceptance of new members. The Club now has 10 motorcycle outfits,2 Kubelwagen, 1 Borgward B2000 troop truck, 1 Zundapp solo KS600, 2 Solo BMW motorcycles , 2cm flak gun , PAK37 gun , Mercedes troop truck , Opel Blitz , Stoever Field car and a large variety of equipment , weapons , radio and field gear. As the Club grew over the first few years and we were invited to attend more and more events, we slowly found ourselves becoming a proper German re-enactment group. Now all 30 members have the correct weapons, uniform and equipment for public shows/festivals/military displays and film work more recently . We represent a kompanie , 3rd Komp, from the Liebstandarte SS Panzer Division, late war , as this is the most appropriate due to our collection of vehicles and 3 tone cammo paint schemes, etc.The L.A.H having being involved from the start of the war right up to the end was the perfect choice of group to portray . Most members are either historically interested in the period or have a genuine love and interest in the vehicles. The Club combined has a wealth of information on all the above and this is evident at public shows. We draw a large crowd at all shows and it is always amazing to see people marvel at the vehicles and equipment, for most have only seen these on film and never in the flesh. Kampfgruppe Sud / Battlegroup South also forms part of the Munster Military Vehicle & Re-enactment Group, together with the London Irish Rifles combining forces to do battle weekends , training weekends and various historical reenactments and military shows . The club in conjunction with London Irish Rifles known as the Munster Military Vehicle and Re-enactment Group run the Duncannon Military Show every year at Duncannon Fort, Co. Wexford, Ireland’s biggest military vehicle and re-enactment event.This has grown steadily over the last 6 years to become a centre point for Reenactment, of all historical periods , in Ireland culminating in one of the biggest WW2 battles staged in the country . Battlegroup south has become one of the foremost used groups for docu-dramas,film work for both big and small screen , and hisorical shows llike the History channel and Discovery channel .An extensive listing of films and movies is on our Film work page. Apart from reenacting , battling and film work we have a great social side to our club, many historical trips to Normandy , Monte Cassino , Berlin, Holland , Belgium and many more places around Ireland where we have taken our vehicles and members and just enjoyed many a good weekend on the road touring as a group of friends. Public Disclaimer: Battle Group South is a military vehicle and re-enactment group who specalise in the collection and restoration of class wartime German vehicles. It does not support or hold any political beliefs in any banned political parties or subscribe to any neo-Nazi movement whatsoever. It is a living history group.